What Women Entrepreneurs Need to Succeed in Emerging Economies? Many efforts have successfully been implemented by both public and private institutions to advance women entrepreneurship, recognized to be an indicator of overall social development. Despite several efforts, women still represent a minority share of entrepreneurship, specifically among the emerging economies. A study conducted to understand the status of entrepreneurial competencies among the male and female genders in India has proved that women were equally competent to men on the required entrepreneurial competencies. Among the 10 entrepreneurial competencies tested, women were found to be marginally inferior only on three competencies. The degree of difference is very marginal, and the effect size is quantified to be only up to 25% of the sample, which would easily be overcome with further efforts. 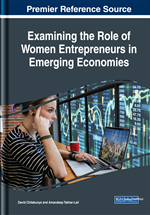 In view of the observations, the chapter proposes to concentrate on the gender gap rather than skill gap to improve women entrepreneurship, specifically among the emerging economies. If by strength is meant moral power, then woman is immeasurably man's superior, said Mahatma Gandhi (1869-1948), Leader of the Indian independence movement and honored as the ‘father of the nation’. Jawaharlal Nehru (1889-1964), the first Prime Minister of India, and architect of the modern Indian nation-state, held that you can tell the condition of a nation by looking at the status of its women. It is however, universally accepted that a positive change in the economic status of women is an acceptable indicator of the development of a nation. Matru Devo Bhava (Mother as Goddess) is an age-old sentiment shared by the Indians. From time immemorial, women have been considered as goddesses like Parvati, Kali, Shakti,Vaishnomata, Durga etc. Indians venerate and salute their nation as Janani or mother. Efforts to promote the role of women in development and to improve their status are no longer seen merely as issues of social justice and human rights (Fujita, 2013), but widely recognized as critical for sustainable development. The economic status of woman is now accepted as an indicator of the society’s stage of development (Singhal, 1995). Women entrepreneurship is acknowledged to be an important source of economic growth. But, women still represent a minority share of entrepreneurship, not only in India, but also across the globe. The Gender-Global Entrepreneurship and Development Index1 (GEDI) compares how countries rank with respect to their Gender-GEDI ranking and their original GEDI ranking and found that only six among a sample of 17 countries, show high potential women’s entrepreneurial development while five countries rank worse (Figure 1). Women’s entrepreneurship can make a strong contribution to the economic well-being of the family and community, contributing to the Millennium Development Goals2(MDGs) and the Sustainable Development Goals3 (SDGs). While India is yet to travel a long road for scaling up opportunities that foster women entrepreneurship (Figure 2), the potential presented by the country is vast (Mishra, 2017). Thus, governments as well as various developmental organizations, across the world, are actively undertaking promotion of women entrepreneurship through various schemes and promotional measures. As a result, the world could see a new generation of multi- skilled, productive and innovative women entrepreneurs, during the 21st Century. In a dynamic world of the present order, women entrepreneurs are likely to become an integral part of the global quest for sustained economic growth and social development (Sharma, 2013). While necessity and determination are often important to foster women entrepreneurship, strong supporting conditions are an imperative for ensuring a high business ownership by women (Ghosh, 2017). On the other hand, there is a considerable body of research that suggests that women may be weaker in financial skills than men (Collerette &Aubry, 1990). More specifically, women frequently rate themselves as less competent in financial skills than do men (Chaganti, 1986). Jennings and Cash (2006) note that there is a solid base of empirical research demonstrating that for the most part male and female business owners do differ in some fundamental ways, which directs the discussion towards a competency based view of entrepreneurship, to understand the problem.